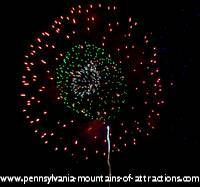 DelGrosso Amusement Park's Summer Thunder is by far best fireworks display through the Allegheny Mountains, possibly in Pennsylvania. 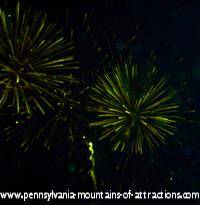 It can be seen every 4th of July in Tipton, PA. In 2005 Summer Thunder was titled "Summer Thunder 2005 - Prelude to Montreal". My words or pictures couldn't possibly do justice to the fireworks show I have witnessed over the years at Delgrosso Amusement Park. Grassi Bros. Inc. are famous for their fireworks display. What makes their show so spectacular is that they partner with Dave Villani, who synchronizes the fireworks show to music. The show always starts with patriotic songs to honor our military. They then move on to honor the people who have enjoyed the show each year and are no longer with us. The combination of the Ground Fireworks Display, the Sky Fireworks Display, along with the synchronized music always ends up being an emotional event. "Summer Thunder 2005 - Prelude to Montreal" was a show beyond any expectations. This show was actually a dress rehersal for The World Famous International Montreal Fireworks Expedition. Year after year Summer Thunder is something you need to experience at least once in your life. 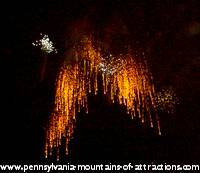 Besides the expedition, the 2005 fireworks display was to honor Mrs. DelGrosso who had passed away a few month before the show. Needless to say, emotions were high that night. The DelGrosso Amusement Park's Summer Thunder in 2005 was nonstop for 40 minutes. The show was so spectacular that while leaving the park I had to brush the tears from my eyes, the ashes off my cloths and out of my hair. Imagine A 4th Of July Without Fireworks! For as long as I can remember my favorite holiday, the 4th of July, has been spent at DelGrosso Amusement Park. Holidays and memories seem to go hand and hand. My family has gathered a lot 4th of July memories at this PA Amusement Park over the years. If crowds and noise are something you would like to avoid, you can always park along the road in any direction. Thousands of people have their favorite places to park each year. Many climb up to the top of Skelp Mountain, it's a beautiful show from there. The view is spectacular, and you can still hear the music synchronization from Waly Radio Station. Let me give you a few good tips if you are planning on enjoying the DelGrosso Amusement Park's Summer Thunder fireworks display next 4th of July. Don't wait until the last minute to get there, the roads will be jammed in any direction. After a day of family picnics, many locals try to get there at dusk. Don't park in the parking lot unless you want to stay for hours after the fireworks show. Turn off the highway onto one of the side-roads along the park. If you can find an opening, just pull your car in. Don't worry about getting a ticket. You'll be amazed at the private fireworks displays people bring along to entertain while waiting on the show to start. Which is usually around 10pm. Sometimes hanging out at your car can be more fun than going into the park. You'll hear radios blasting, see people dancing, kids starting their sparklers, and people showing off their personal fireworks. Just bring along a cooler full of drinks and some good snacks and enjoy some old fashioned Allegheny Mountain family fun. Come to Pennsylvania, feel the excitement, celebrate this fabulous holiday the way it's meant to be celebrated. I have to warn you, it's addicting, you're 4th of July will never be the same again without Summer Thunder! Visit all the Pennsylvania Amusement Parks through the Allegheny Mountains, each PA Amusement Park is unique in its own way.